Come on out and join us for a cup of coffee and some great conversation. Starbucks will be hosting a "Coffee with the Sheriffs" on Thursday, May 17th, 2018 from 9:30 a.m. to 11:00 a.m. The Starbucks is located at 1263 Huntington Dr. in the city of Duarte. No agendas or speeches. 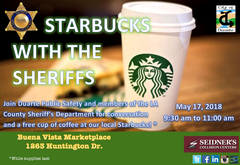 Just a chance to ask questions, voice concerns, and have a great cup of coffee with your deputies. Hope to see you there.